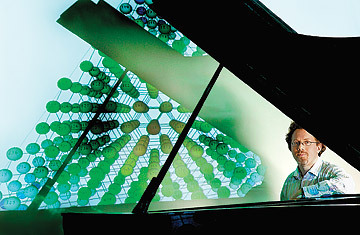 Dmitri Tymoczko at Princeton University, where he teaches and has developed a geometric method of representing musical chords. But if you go to Tymoczko's website music.princeton.edu/~dmitri) you can see exactly what he's getting at by looking at movies he has created to represent tunes by Chopin and, of all things, Deep Purple. In both cases, as the music progresses, one chord after another lights up in patterns that occupy a surprisingly small stretch of musical real estate. According to Tymoczko, most pieces of chord-based music tend to do the same, although they may live in a different part of the orbifold space. Indeed, any conceivable chord lies somewhere in that space, although most of them would sound screechingly harsh to human ears. The discovery is useful for at least a couple of reasons, says Tymoczko. "One is that composers have been exploring the geometrical structure of these maps since the beginning of Western music without really knowing what they were doing." It's as though you figured out your way around a city like Boston, for example, without realizing that some of your routes intersect. "If someone then showed you a map," he says, "you might say, 'Wow, I didn't realize the Safeway was close to the disco.' We can now go back and look at hundreds of years of this intuitive musical pathmaking and realize that there are some very simple principles that describe the process."